Apparently, a lot of folks must read Tim Ferriss, as there were two requests in the “List of the Week” suggesting a rollup of Virtual Assistants. Given our focus at Smartsheet on tapping the virtual workforce, this made sense to us. I’d like to make a big deal about how hard this was to pull together, but frankly, I have to admit it was cake. 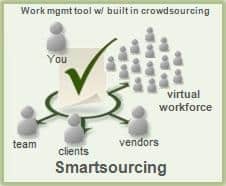 We’ll likely reach out to these small businesses to inquire as to their interest in Smartsourcing for their client base. There’s an amazing opportunity for them to provide some pretty nifty services to their clients that should dramatically increase their earning potential. Maria has a nice post on that here. For those VAs that were missed in this run, it was entirely unintentional. This was simply what the virtual workers provided in its raw form. Please add your business to the list with this form, and I’ll make sure it gets sorted alphabetically into the list. You’ll see it appear live when you refresh your browser. We’re a huge fan of VAs here, and highly recommend that you look at what isn’t getting done well in your business and consider getting help from one of these professionals. Thanks a lot for sharing the list of VA. Thank you for this great list of VA's and for giving me the opportunity of adding my name to the list. Please change at your earliest convenience. Really very good post. Thank you for adding this list. I myself a virtual assistant was amazed to see this list. good collection. To deliver the services and to communicate with the clients Virtual Assistants utilizes today’s technologies by working for them remotely. A virtual assistant can help you grow your business by handling the administrative support tasks. Just think, instead of hiring a full time employee, you can hire a virtual assistant and could save tens of thousands of dollars. Also when you are on a vacation or a holiday you can relax and enjoy while all your work will be getting done by your Virtual Assistant. Virtual assistant blogs are an awesome way to keep up with what’s going on in the industry and get latest updates.I love reading virtual assistant blogs! I like this virtual assistant list as it is beneficial to virtual assistant service provider and for business enterprises. virtual assistant too. Thanks for sharing! Your list is amazing. Thanks for sharing such a huge list, which is really worthy. I appreciate your post. I can see that you’re an expert in this region. I am starting an internet site soon, and your information will be very helpful for me.. Thank you for all of your help and wishing you all the success inside your business. It was a really a piece of cake because the system was properly planned. Good job guys!